Tablets in a floating dispenser are a good choice if you soak in your hot tub every day or at least every other day. Each time you sit in your hot tub you deplete the sanitizer level and raise the pH so the tablets continuously dissolve adding more sanitizer to keep your hot tub water clean and clear. Unfortunately, most people don't sit in their hot tubs every day or even every week but the tablets in the floating dispenser still dissolve at the same rate so it's very easy to overdose your hot tub with a floating tablet dispenser. 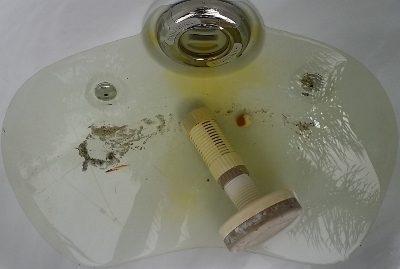 Mismanaged tablet dispensers are the leading cause of sanitizer overdose in covered, portable hot tubs. Sanitizer overdose is the leading cause of premature hot tub failure due to chemical damage. Sanitizer tablets tend to overdose portable hot tubs. Overdosed bromine or chlorine levels makes soaking in the water caustic and unpleasant. Tablets also lower pH making the water very acidic increasing the chance of skin irritation or dryness. When you soak in your tub the hot water makes you sweat and the jets scrub off body oil, dead skin cells, deodorant and sunblock. These organic and inorganic byproducts are called bather waste or bather load and all these bather byproducts raise the pH of the water every time you soak. Bromine tablets are acidic with a pH of 4.5. Chlorine tablets are even more acidic with a pH of 2.9. 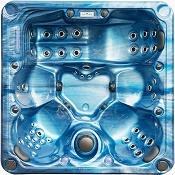 If you use your hot tub every day the high-pH bather load offsets the low-pH tablets and the water tends to balance out. Unfortunately, most people don't use their hot tubs every day or even every week so there is no bather load to raise the pH. This allows the tablets to overdose bromine or chlorine levels and drives the pH too low making the water very acidic. 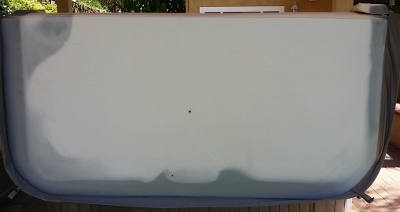 The bottom of this brand new hot tub cover was originally grey but a mismanaged tablet dispenser bleached & burned the bottom in just a few weeks. If you use a floating tablet dispenser you must remember to adjust the output as bather load changes; more bromine or chlorine for heavy bather loads and less during periods of non-use. If you don't use your covered tub for several weeks you might have to remove the dispenser from the water to prevent overdose. Overdosed sanitizer and very low pH turns your water into a caustic, chemical brew that reacts when you disturb it by giving off noxious fumes that burn your eyes and take your breath away every time you turn on the jets. Prolonged eposure to excessive sanitizer levels and very low pH can permanently damage your hot tub. Every jet body gasket in this hot tub was damaged by excessive chemistry. Every jet in this seat leaked and had to be repaired. If this combination of bad chemistry can permanently damage the cover, plastic pipes and gaskets in your hot tub imagine what it does to your skin! Sodium Dichloro-S-Triazinetrione (Dichlor) is a granular chlorine that can be added to your hot tub water in small, measured doses before and after each soak. One or two Tablespoons of Dichlor before each soak is usually enough to sanitize the water and quickly kill germs on your body as you slip into the water. This small, fresh shot of chlorine ensures any microbes lingering in the water or on your body are destroyed before they have a chance to multiply. One or two Tablespoons of Dichlor after each soak is usually enough to oxidize or destroy bather waste such as sweat, body oil & dead skin. This small, fresh shot of chlorine ensures the organic and inorganic waste is destroyed a soon as you're done soaking right after you get out of the water. Sodium Dichlor is nearly neutral with a pH of 6.5 so you don't change pH every time you dose with chlorine. Using the right chlorine for portable hot tubs automatically means you'll spend less time chasing changes in pH. Controlled, measured, manual doses of chlorine more closely match the way most people use their portable hot tubs. You can reduce chlorine use by 60 to 90% just by using the right chlorine and manually dosing your hot tub only when you need to. But what about "Cyanuric Acid"? Sodium dichlor is buffered which means it contains cyanuric acid (CYA) which helps keep sunlight from breaking down chlorine in uncovered swimming pools and spas. When dichlor is used 0.9 ppm of cyanuric acid is added to the water for each ppm of available chlorine added. Cyanuric acid slows down the degradation of free chlorine by sunlight. The effect of cyanuric acid on slowing the oxidation of organics, kill rates of bacteria, viruses and algae has been demonstrated, primarily in controlled laboratory studies. Since your portable hot tub is covered, you don't really need cyanuric acid because there is no exposure to ultraviolet light but most Sodium Dichlor you'll find on local store shelves will contain CYA. Since, CYA acts as a buffering agent it will make chlorine less reactive so it lasts longer but it also builds up in your portable hot tub eventually reaching a level where it can substantially reduce the effectiveness of chlorine. CYA should be limited to 100 ppm so small, measured doses of chlorine before and after each soak helps to avoid CYA buildup. 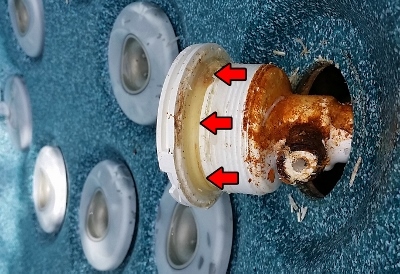 If you drain and refill your hot tub on a scheduled basis you can completely avoid problems with CYA buildup. In fact, you can use CYA level as another way to know when you should dump a batch of water down the drain and start over. If the test strip indicates CYA is 100 ppm or higher: drain & refill. Click to SCHEDULE a $145.00 Drain, Clean, Refill and Simple Hot Tub Chemistry Startup! When you add any kind of chlorine to your hot tub water it dissolves into hypochlorous acid (HOCl) and hypochlorite ion (OCl¯) with the amount of each depending on the pH of the water. Only the HOCl compound is a sanitizer and high pH blocks HOCl production so you can get twice as much work from every dose of chlorine if you simply test and adjust pH as needed before adding chlorine. High pH (8.0) can reduce chlorine effectiveness by 75% so you have to use a lot more chlorine to get the job done and it takes longer! Lower pH before adding chlorine and you can reduce chlorine use by at least 50%. If your hot tub pH is 8.0, only 25% of the chlorine you add becomes germ-killing HOCl so it takes more chlorine to keep your water clean, clear & sanitary. Chlorine shows up on the test strip but doesn't do much because pH is too high preventing chlorine from forming HOCl. If your hot tub pH is 7.0 about 75% of every dose of chlorine converts immediately to germ-killing HOCl. Lower pH also makes chlorine react faster. You can kill more germs faster and oxidize more bather waste with smaller doses of chlorine if you test & adjust pH before adding chlorine. If your hot tub pH is 6.5, up to 90% of your chlorine is killing germs which also makes the chlorine unstable so it's used up quickly. Since your covered, portable hot tub is essentially a sealed tank, a high chlorine residual between soaks isn't as critical. Test strips, test kits and all conventional instructions tell you to keep your hot tub pH between 7.2 and 7.8. Any pH below 7.0 is acidic and acidic water will etch and damage the porous and reactive surface of concrete and plaster pools and hot tubs. 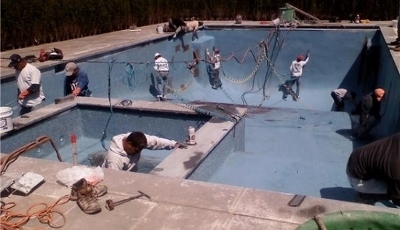 Repairing etched plaster in a concrete swimming pool is a big, expensive project. Your portable hot tub is made almost entirely out of non-porous, non-reactive plastic selected specifically because it's highly resistant to harsh chemical conditions that would otherwise damage a concrete and plaster tub. The only metal components in your portable hot tub that directly contact the water are the stainless steel heater manifold and incoloy or titamium heat elements. The metal parts in your tub were engineered to withstand long term exposure to slightly acidic water. 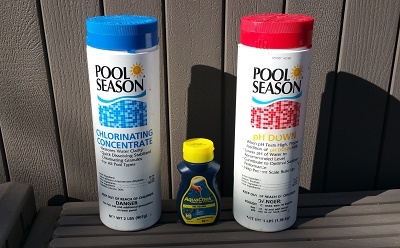 Test strips, test kits and conventional instructions tell you to keep your swimming pool pH in a tighter range from 7.4 to 7.6. That's because swimmers and divers submerge their heads exposing their eyes, noses and sinuses to the water so pH is maintained to avoid irritation. You shouldn't be submerging your head in hot tub water for various reasons so matching pH to your eyes, nose and sinuses is less relevant. The 'acid mantle', a layer of oil and sweat that protects every square inch of your skin, maintains a much lower, natural pH around 5.5. Soaking in water that is slightly acidic makes every dose of chlorine work up to 50% harder and faster so you add much smaller doses of chlorine before and after each soak and the chlorine also burns off faster. Water with a slightly acidic pH more closely matches the natural pH of your skin for better soaking comfort especially during long, hot soaks or the vigorous scrubbing action of hydromassage jets. 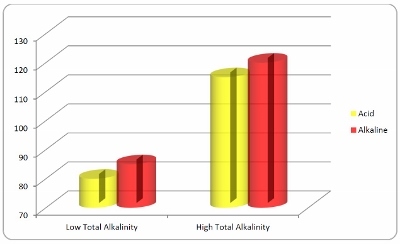 Total Alkalinity (TA) measures the ability of your hot tub water to resist changing pH. When you add acidic sanitizers such as bromine or chlorine tablets, TA helps buffer or absorb the effects of the acid so pH doesn't change as fast. Acidic sanitizers such as chlorine tablets (pH 2.9) and bromine tablets (pH 4.5) quickly use up TA and drive pH down especially when there is no high-pH bather load to offset the acid buildup. 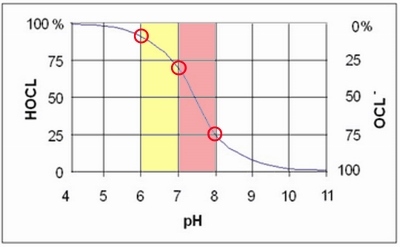 When Total Alkalinity is low, it can be difficult to make small changes in pH. When Total Alkalinity is 120 to 400 ppm small adjustments to pH are much easier. If you use tablets, but don't soak in your portable hot tub at least once a week, you still have to go out every week to adjust pH and TA or the water becomes acidic and aggressive making the water caustic and irritating. Sodium Dichlor (pH 6.5) is nearly pH neutral to begin with and you only add small, measured doses before and after each soak so the impact on pH and TA is nearly eliminated just by using the right chlorine for portable hot tubs. No... you shouldn't use bleach in your hot tub but at a molecular level, Sodium Dichlor works the same way as the liquid, chlorine bleach you probably use to disinfect or sanitize things around the house and brighten whites in the laundry. 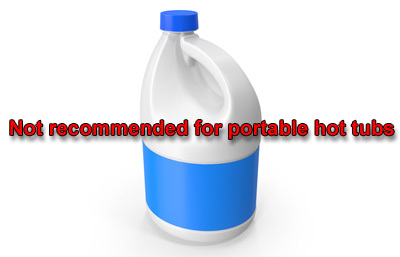 Household bleach is Sodium Hypochlorite with only 5 to 7% active chlorine. 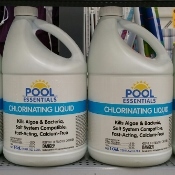 Liquid 'pool chlorine' is just bleach but slightly stronger with 11 to 13% active chlorine. Sodium Dichlor is granular with 56 to 62% active chlorine. When you disinfect things around your house with chlorine bleach you are killing bacteria, viruses and other microbes the same way chlorine sanitizes the water in your hot tub. Chlorine can penetrate and damage the cell membranes of microscopic organisims such as harmful bacteria and viruses either killing the microbes instantly or preventing them from multiplying. When you add a small amount of bleach to a load of cotton t-shirts you are bleaching or oxidizing stain out of the fibers the same way chlorine oxidizes bather wastes from your hot tub water. Chlorine can bleach or chemically burn organic contamination so the same way you can 'burn' a load of cotton t-shirts by adding too much bleach, you can also oxidize or 'burn' bather waste out of hot tub water. While tablets are acidic and reduce pH quickly making the water too acidic, liquid chlorine (Sodium Hypochlorite) has a very high pH (13) so every dose of liquid chlorine quickly raises pH making the water too alkaline. High pH dramatically reduces the germ-killing effectiveness of chlorine so every time you dose with Sodium Hypochlorite you also have to adjust pH or the chlorine you keep adding won't do much work. Any time or money you save using liquid chlorine you spend chasing and adjusting pH. Sodium Dichlor has a pH of 6.5 so small, measured doses before and after each soak have minimal effect on pH. 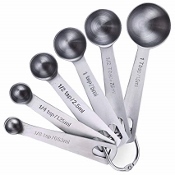 Test the water before each soak and if needed add enough Sodium Dichlor to raise level to 3 - 5 ppm. This small, fresh dose of chlorine sanitizes the water right before you climb in and instantly attacks any germs on your body as you slide into the water so they don't have a chance to multiply and contaminate your hot tub. While you soak, you sweat up to 3 pints per hour and the jets scrub off body oil and dead skin so you leave behind organic bather waste. Any personal products such as deodorant, hair products, cosmetics and sunblock remaining on your body dissolve in the hot, turbulent water leaving behind inorganic bather waste. 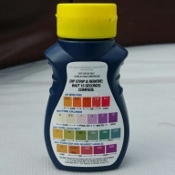 Test the water after each soak and if needed add enough Sodium Dichlor to raise level to 5 - 10 ppm. This small, fresh dose of chlorine, helps oxidize bather waste as soon as you're done soaking. Chlorine in your hot tub water gets used up quickly as it oxidizes out the bather waste so a small dose is usually needed to keep the water clean and clear until the next soak. The U.S. Environmental Protection Agency (EPA) has issued clarification statements because the term "shock" is frequently misused in the pool and spa industry. The EPA considers the word shock to be a pesticide claim with the intent of killing germs. A small, measured dose of Sodium Dichlor before each soak shocks or sanitizes any germs lingering in the water since your last soak and instantly kills any new germs on your body as you slide into the water. A small, measured dose of Sodium Dichlor after each soak oxidizes or destroys organic and inorganic bather waste so your hot tub stays clean and clear when the cover is on between soaks. A typical in-ground swimming pool can contain 20,000 to 40,000 gallons of water which can cost $300 to $600 to refill but most people understand it would be wasteful to drain and refill that much water without good cause. A typical portable hot tub only holds around 400 gallons and only costs around $2.96 to refill. Chemistry that makes sense for a swimming pool just doesn't add up in the small volume of water in a portable hot tub because the whole batch of water costs less than a pint or a pound of any product sold to treat the water..
People-per-gallon. Four people soaking in a hot tub are the equivalent of at least 80 people in a typical swimming pool. The hot water makes soakers sweat up to 3 pints. The jets rub off body oil and dead skin. A small batch of hot tub water gets dirty a lot faster than a big batch of swimming pool water. Don't shovel piles of money into a portable hot tub over a $2.96 batch of water. An uncovered hot tub or swimming pool needs a daily dose of sanitizer and oxidizer because the water receives a daily load of debris such as dust, pollen, insects and leaves all laden with bacteria even when nobody swims in the water. An uncovered hot tub or swimming pool needs a daily dose of chlorine to keep it from turning into a swamp. Your covered, portable hot tub is an insulated, sealed tank that stores the water and protects it from the outside environment. Since your covered tub doesn't receive a daily load of debris it doesn't need a daily dose of sanitizer & oxidizer unless you remove the cover and soak in your tub every day. Don't add a daily dose of chemistry to a portable hot tub unless you remove the cover and soak in the water every day. In a covered, portable hot tub, bather load is the biggest variable. 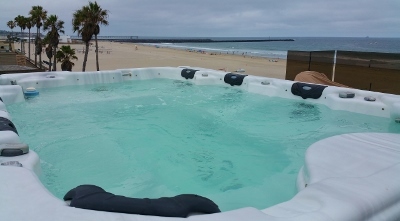 In fact, a covered portable hot tub is essentially a sealed tank that can stay clean and sanitary almost indefinitely as long as nobody lifts the lid or sits for a soak. If you soak in your tub a lot, the water will need more frequent testing and adjustment. If you soak in your hot tub very little, the water will need much less frequent testing and adjustment. Don't pour pounds of chemistry into a portable hot tub nobody is using. In-ground swimming pools are typically constructed of concrete & plaster which are relatively porous and reactive materials. If pH, Total Alkalinity or Calcum Hardness are too low the concrete & plaster can be dissolved or etched leading to expensive repairs. Your portable hot tub is constructed almost entirely from non-porous, non-reactive plastic selected specifically for resistance to the harsh chemical environment commonly encountered in hot tubs. 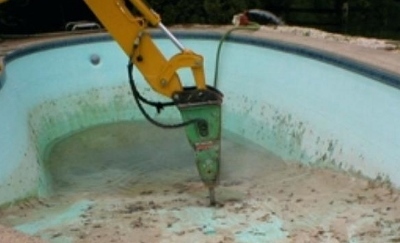 The plastic in your hot tub is far more resistant to lower pH that would damage concrete & plaster installations. You can deliberately adjust portable hot tub pH so the water is slightly acidic and chlorine works twice as hard and twice as fast. 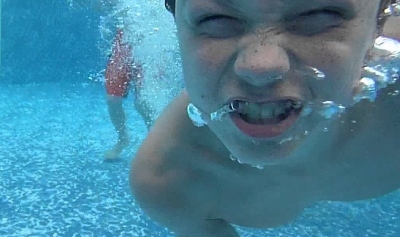 Swimmers & divers sumberge their heads in the water so swimming pools are maintained to a more narrow pH of 7.4 to 7.6 to match the pH of swimmer's eyes, noses and sinuses. Soakers in a portable hot tub generally don't (and shouldn't) submerge their heads so pH can be lowered to maximize sanitizer effectiveness. The lower pH also more closely matches the pH of your skin (5.5) for better bather comfort during long soaks. Your covered, portable hot tub doesn't use water it stores & recycles water. It takes about 400 gallons of water to fill a typical portable hot tub so many hot tub owners worry about wasting water when the opposite is really true. Your portable hot tub is, by far, the most efficient water appliance you own. The San Diego County Water Authority says we use about 150 gallons of water per person per day so a typical family of four can be expected to use 400 to 600 gallons every day and every drop of that water goes straight down the drain after just one use. Most high-efficiency clothes washers use 15 to 30 gallons per load while older machines can use 30 to 50 gallons per load. Most families use enough water just doing laundry every week to refill a typical portable hot tub. 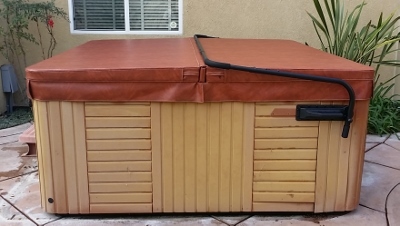 A typical portable hot tub stores around 400 gallons of water. 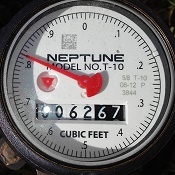 A typical family of four uses at least 400 gallons of water every day. A hot tub refill represents about 1/30th of your monthly water use or about 1/90th of your quarterly water use. Your covered portable hot tub is even more efficient than a swimming pool because an uncovered pool loses inches of water to evaporation every week but your covered hot tub is essentially a sealed tank so evaporation loss is virtually zero. Unless you own a fish tank, your hot tub is the only appliance that stores a batch of water then automatically filters and recycles that same batch every day so you can use it over and over again for weeks or months at a time. A typical portable hot tub stores a 1-day suppply of water then automatically filters and recycles the same batch of water every day so you can use it over and over again for weeks or months at a time. Your insulated cover turns your portable hot tub into a sealed storage tank which protects the water from evaporation and contamination from the outside environment. Simple Hot Tub Chemistry keeps chemical products and doses to the absolute minimum so you can get even more miles-per-gallon from your covered, portable hot tub than any other water-using appliance in your home.